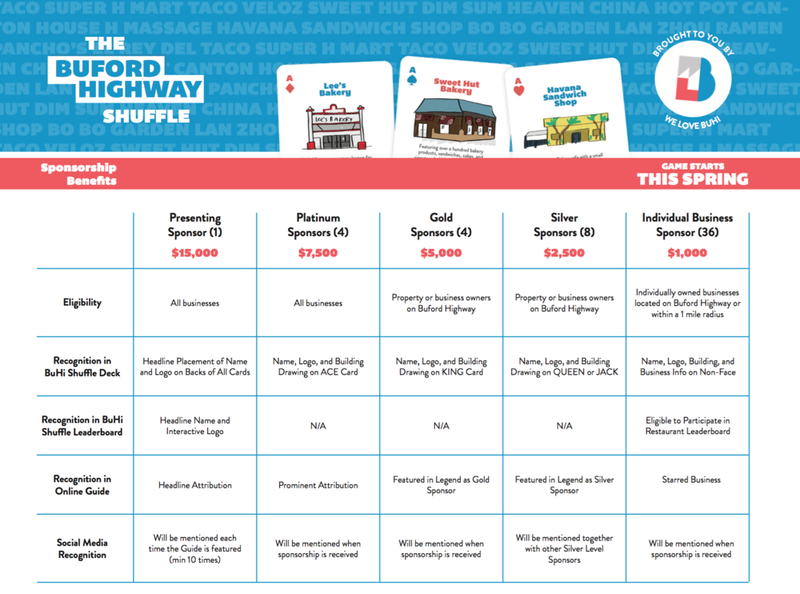 We invite you to sponsor The Buford Highway Shuffle, a companion program to our 2018 Guide to Buford Highway! Explore the different levels of benefits to find the one that is best for your company. To register as a Sponsor, please fill out the form at the bottom of the page. If you have any questions, please contact us at info@welovebuhi.com. Best email address to reach you. Name of the company that will receive sponsor recognition and benefits. Please provide a brief 3-4 sentence description of your company. This can include your company's history, mission and vision, and specialty or exclusive products or services. We will use this description in our Featured Sponsor section. Best number for customers to call to reach the company. Best email address for customers seeking information about the company. Check the desired sponsorship level, and we will send you an invoice for the matching sponsorship amount. Thank you for joining our community of friends and supporters! We will send you an invoice in the amount corresponding to the sponsorship level you selected and begin providing benefits once your payment is received. Please email a high-resolution logo for your company to info@welovebuhi.com so that we can give your company proper attribution as a sponsor! If you have any questions, please contact us at info@welovebuhi.com.